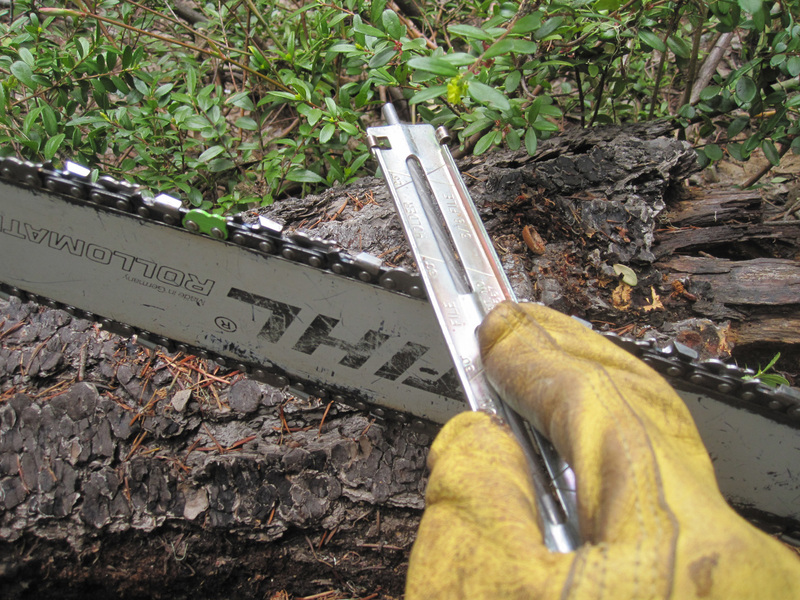 Pixie’s chain was sharp when we hit the trail this morning (my crew is weird–we name our chainsaws). I felt gleeful when I powered the saw into the first green log of the day and big chips spewed out the back. But a couple logs later, the inevitable happened. There was a large-ish rotten Douglas-fir squatting right down on the ground. I couldn’t see very well, so wasn’t sure when I was going to complete the cut. When I noticed a couple of sparks, I knew I had gone too far. We rolled the log away and I saw the groove in the dirt made by the chain. Ooh, that’s bad. It’s best to keep the whirling chain away from dirt and rocks, but sometimes it can’t be helped. I rooted around in my pack for the saw kit, and pulled out the file. A rotten log next to the trail would do for a workbench, and I knelt down in front of it. Field sharpening is a skill at which I do not excel, so it was time for practice. In the shop, the saw is held by a vise so I can stand in a comfortable position. It’s a lot easier. The file is a 3/16ths inch round file for sharpening saw chain. I use a file guide to keep a consistent angle on each tooth. All the teeth on one side are filed, and then the saw is flipped so I can file the other side of the chain. While I do this task, I hold more than one focus. The front of my brain, my eyes, and hands are paying attention to the angle of the file, and counting the strokes. But my ears are tuned to the sounds in the woods: noisy river, varied thrushes, aircraft up in the clouds. My belly is digesting lunch, my knees and ankles are feeling the weight of supporting me as I lean over my work. Sweat dries on my back now that I am not hiking. Tooth by tooth, minute metal filings dust the sharp edges. When I start cutting the next log, I know I haven’t done as well as I would have liked. But it’s the last log–the trail is buried under snowbanks that persist under the trees. We’ll have to come back when they melt. I’ll have a chance to file that chain in the shop before Pixie goes out again. I’m field-testing a new work pack. 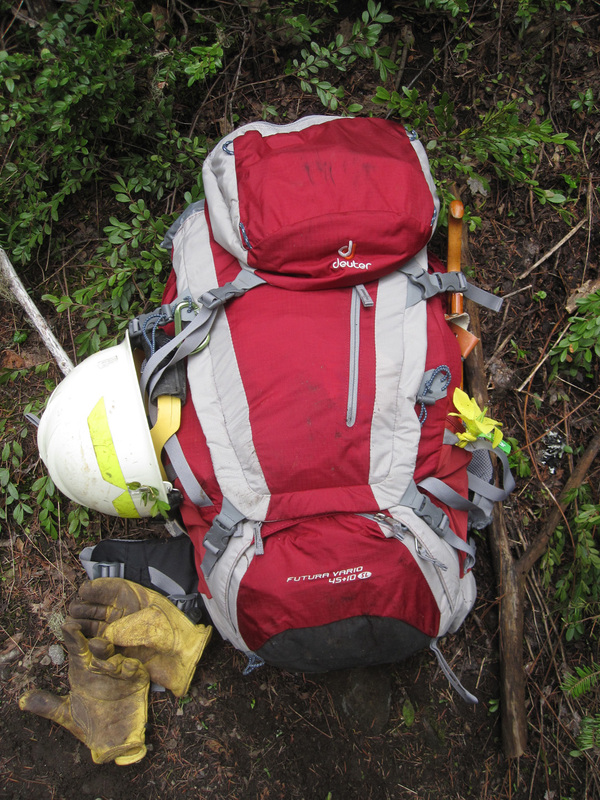 I’ve written before about the challenges of finding gear that works for trail crew. My back and shoulders insist that I make changes. After online research, I settled on a Deuter Futura Vario Pro, a small overnight pack. The two features I most want in a work pack are adequate suspension, and side pockets. This one is rated to carry 40 pounds, and is designed to distribute the weight away from the shoulders. When I put the saw over my shoulder, the top of the pack supports it nicely. Yes! I’m happy. The side pockets are not perfect–getting my hand held radio out is something of a wrestling match. But at least I can get to it. Deuter packs are German, so I have hopes for sensible engineering and durability. Oh, and please note the yellow fabric flower. It’s a lily. It’s a women’s pack, which I approve of because it may fit my anatomy more comfortably. The flower is a concession to my innate femininity, even though I am out in the woods wallowing in dirt and getting sawdust in my bra. After my tirade last summer about a new personal backpack named “Trollhetta Lady”, I have nothing more to say about gear manufacturers marketing to women (this blog, August 2011). But I’m leaving that dang flower on my work pack till it’s soaked with bar oil and rots away from pure filth and abrasion. I will not be mistaken for a boy! Unsettled weather all day. Perfect for working, really. Not too hot. Not windy. A few light rain showers, and some sun breaks. Walking along, I notice a couple of calypso orchids. Another name for them is fairy slippers, and their bright pink jumps off the forest floor. The leaves are just emerging on the vine maples and huckleberries–the understory still seems open. More twigs and branches than foliage. Soon it will be different. The woods are changing all the time, and I amazed at my own amazement. This cycle is familiar, yet I never tire of it. How good it is to be out there doing good work!